The ladies of Scobey Lutheran are busy with quilting, going to a Bible Study, serving receptions for weddings, funerals or other occasions, baking bars for a reception, making sandwiches, serving a potluck, helping the men with the Lutefisk Dinner, taking care of the Altar for every service, providing music, helping with League, becoming a mentor, teaching Sunday School, ...........and any other activity you can add to the list. The Ladies Aid has a nice selection available of greeting cards for birthdays, sympathy, births, confirmation and graduation as well as get well and cards of encouragement. There are decorative napkins and a few other small items such as bookmarks, and magnetic buttons. They are in the Church Office. The hours you can stop by to purchase them are Monday - Thursday 9-2 and Friday 9-1. Many years ago a group of ladies set up a former Sunday School room in the basement of the church for their quilting projects. There was sufficient space to set up sewing machines, cutting table, quilting table, and room for stacks of boxes of fabric, batting, etc. Every Thursday morning from 9:00 AM to Noon there is activity going on in this basement room. They make baby and youth quilts that are taken to Ronald McDonald House in Billings and as many quilts as possible that are given to Lutheran World Relief. They also put together school kits to be shipped overseas. The fabric is donated. Sometimes old clothing is cut apart to make blocks. The ladies are creative with the fabrics they are given and quilts are beautiful as you can see by the pictures. During March and April the quilts are on display around the gym in the Education Building. All women of Scobey Lutheran are members of the Ladies Aid. This group is called on to serve a funeral reception, wedding reception, or a dinner. You may be called upon to donate a pan of bars or open face sandwiches for a reception or asked to come and help serve and clean up. Each Sunday and any other day of the year when there is a worship service this group of women is responsible for setting out the correct paraments, setting up for communion, decorating for a holiday, keeping the pews stocked with communion cards and cleaning up the communion cups after the service is over. This spring the ladies in the Altar Guild took inventory of the paraments (the cloth covers on the altar, pulpit and lecture) and suggested that we begin working to replace some of them. 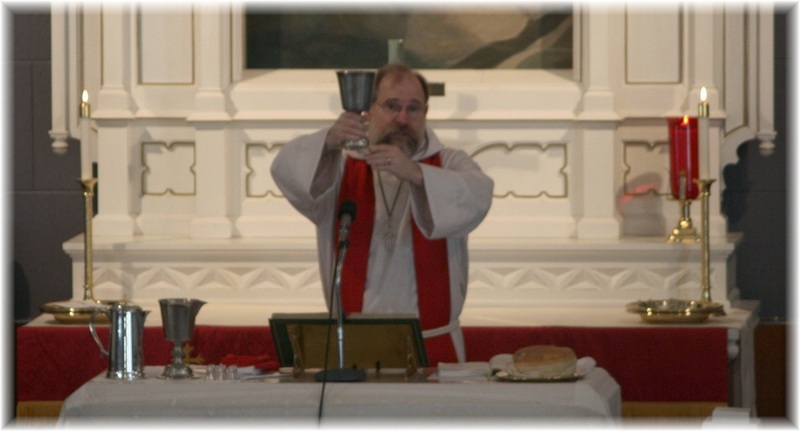 The green set used during Pentecost, the longest season of the church year, are the oldest and most worn. A couple of the other sets are looking tattered as well. A set can cost over $1,000. These are made from a heavier damask cloth and embroidered with the symbol of the season. Donations have been coming in. If you would like to help designate your memorial check with the word "paraments". Several ladies met on September 19th to discuss distribution and construction of Prayer shawls, quilts, fleece blankets and other ways of making shawls. All input is welcome. Please feel free to come and share even if you do not have a project that you want to bring to work on. We are reading a book called "Knitting by Faith" by Julie LeeSong Norman. This is an inspiring and entertaining celebration of the craft that combines a belief in God. This book talks about the thought process used in building projects, and the parallels of Christian faith. It is truly inspiring and uplifting as the author tells her story. This book is available for download on a Kindle application for 99 cents. I have not been able to find a hard copy of this book, but there are several other books along the same line that would also be good.